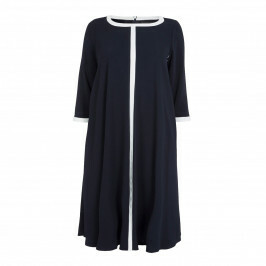 What could be more timeless and versatile than a longline fluid coat in classic navy with chic white tipping. Expertly crafted by Marina Rinaldi it's made to create a clean silhouette. 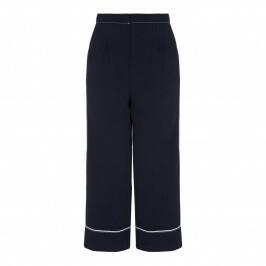 Wear it with the navy sheath dress also by Marina Rinaldi for a look that can be tailored to business or smart casual depending on how you accessories. Straight duster coat in matt envers satin crêpe with round neck, three-quarter length sleeves, pockets set in at the sides, slit at hemline and trim in contrasting colour. Unlined. Hook fastening at the collar. 100% polyester. Do not wash with water. Do not bleach. Cool iron max 110 °C. Delicately dry clean using perchloroehylene. Do not tumble dry. Do not professional wet clean.